Let’s be clear. This is not yet another chauvinistic how-to manual designed to inflict more pressure on, and anxiety in women or the men who love them. Relationships are serious business. Beyond the initial giddiness, heart palpitations, syrupy declarations, and grand promises, there’s work to do by both parties. Women are one of God’s greatest gifts to the world. They have the power to heal, encourage and satisfy their husbands. Wives are called to support and minister to their husbands in ways that no other person on earth can. 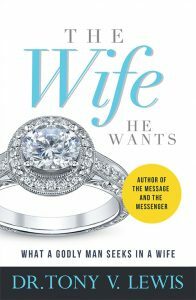 In the new book by Dr. Tony V. Lewis, The Wife He Wants, Dr. Lewis underscores the spiritual secrets that every godly man wants in his wife. Written from years of both ministerial experiences, this work is a great guide for both men and women who are looking to enrich, revive, and re-establish their marriage on both Biblical and practical principles. Jabez Publishing House www.cityofjabez.com is a Christian publishing company helping authors edit their manuscripts, publish, print and successfully market their books nationwide. He has earned both Bachelor of Theology and Master of Divinity degrees, a Ph.D. in Theology, and a Doctorate in Christian Counseling. Dr. Lewis is a Certified Christian Counselor, Anger Management Specialist, Integrated Marriage and Family Therapist, Christian Chaplain and Biblical Life Coach. He is also the author of The Message and The Messenger “A Guide To Basic Sermon Preparation and Ministry Protocol” and Word Potential “Essays On The Faculty Of Spoken Words”. He is happily married to Dr. Carla D. Lewis. First Lady Lewis, an anointed psalmist, works closely in ministry with Dr. Lewis. They are the proud parents of three wonderful children, Tony, Timothy and Breanna. For more information on Dr. Lewis, visit www.tvlewisbooks.com or www.christianbibleinstitute.net.